In the first part of 2015, Temple Brewing kicked off a partnership with the highly regarded Royal Mail in Dunkeld. It saw them raid the kitchen garden of the Grampians restaurant and place the spoils in a beer. 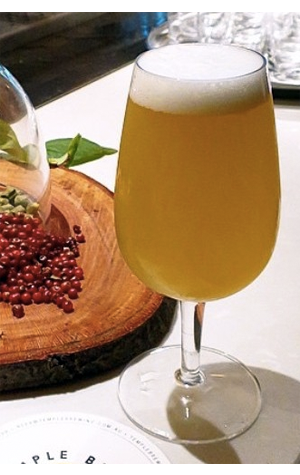 The result was Season's Harvest, a Belgian style witbier brewed with lemon verbena, a plant with intense and lively lemon characters, and pink peppercorns. They were that happy with the results that they returned this year to pick some more, thus creating a beer rather different to most of the harvest ales that have been hitting taps in recent weeks. If anything, the 2016 version is even more verbena'd – if you want an idea of how pungent it is, take a trip to Temple's brewery and take a whiff of the bucket of the stuff on the bar. It's the dominant characteristic, adding waves of lemon sherbet lolly like aromas and a touch of lime to the more subtle spiciness of the underlying beer and creating a beer that we imagine chefs – amateur or otherwise – will be eager to play with.